Start: Lyndhurst village centre, or from the Forestry Commission car park close to Bolton’s Bench. Distance: 6 kilometres (3¾ miles) from Lyndhurst village centre. 4.5 kilometres (2¾ miles) from the Bolton’s Bench car park. On this walk, absorb the atmosphere of White Moor, an area with a fascinating military history. 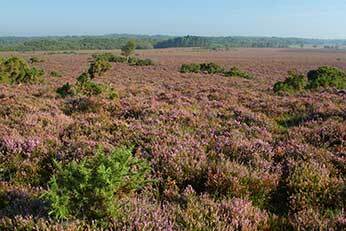 Here Victorian rifle range butts, earthen banks in front of which were placed targets, remain concealed amongst the trees, whilst engulfed in heather are the remains of trenches used during military manoeuvres prior to and during the First World War. Follow in the footsteps of ancient travellers by walking for a while along the old Salt Way, a route inland from the nearby coastal salterns. Look out also for the Park Pale, a medieval earthen bank that once surrounded Lyndhurst Old Park, a deer park that dates back to at least the 13th century. Notice too, a Bronze Age barrow still visible on the heath, the last resting place of people who inhabited this area 3,500 years, or so, ago. Enjoy the gorse’s yellow flowers that brighten the heaths throughout the year, and the cross-leaved heath, bell heather and common heather that blooms from June to September. Watch also for Dartford warblers, woodlarks and linnets, and from May to August, listen at dusk for the churring calls of nightjars. In the warmer months, butterflies, too, brighten the landscape. Look out on the heaths for nationally rare silver-studded blues in July and early August, and graylings from mid-July to early September. Adjacent wetland areas hold breeding season curlews that announce presence with mournful, plaintiff cries and undulating courtship flights, whilst Lapwings beat the air in frenzied display, declaring territory and driving off intruders. Marvel at the fine old oaks and beeches of Mallard Wood, the haunt of springtime redstarts and wood warblers, and a year-round throng of resident birds. Look out also amongst the woodland bracken for movements that might betray a deer as it slips quietly away, keen to keep from sight, for here fallow deer are common and widespread, both on the heaths and in the woods. And walk for a while beside the Beaulieu River at Longwater Lawn. In spring and summer, the river is often little more than a narrow ribbon of water, bedecked with water crowfoot, but after rain it is a more substantial water course. In winter, trout come here to spawn, whilst in their own season, brightly coloured dragonflies and damselflies dart and dance around the water’s edge.